In the heart of Florence’s historic center, Residence Hilda offers tasteful self-contained apartments giving guests the chance to live like a local for a few days. For as long as I can remember, it has been a dream of mine to live among the charismatic buildings and cobbled streets of Florence. To be surrounded by views of the Duomo, the smells of espresso and good food, and the whine of Vespas. I suspect this is an idea which appeals to many. Italy is a place which holds a certain romance around the world, and Florence is one of the jewels in its crown. It is a city with so much history, so much visual charm and so many good restaurants and cafes. While I can’t say that I have lived this dream in full, at Residence Hilda I got the chance to live it for a few days, at least. The beauty of Residence Hilda is that it lets you feel like a genuine inhabitant of Florence historic center. Located on the Via dei Servi in the heart of Florence, Residence Hilda is housed in one of the classic old Italian townhouses which give the country’s cities such a charming look. It is within a kilometer walk of Ponte Vecchio, the Medici Palace, the gallery where Michelangelo's David is on display and the Leonardo Da Vinci museum. The Duomo is at the end of the street, and if you look directly along it you will see its dome dominating the scene from the hotel entrance. The hotel has been in existence since 2005 when it was founded by a local Italian family after the building was donated to them. While the façade looks typically historic, inside it has been renovated with a large bundle of love, passion and thought – a process that took two years to complete. Parts of the hotel were once gardens, and there was even a graveyard within its limits – part of the tombstone of a friar still hangs on one of the walls in the courtyard. Inside, the decoration is pure Italian. The floors are chequered black and white, the period furniture is made of wood and the halls are adorned with flowers and houseplants. It is a minimalist style that is complemented by well-chosen features like the Philippe Starck chairs. The colors are understated with tans and whites used on the walls. Again, the design makes you feel like a local, as I am sure that the old Italian ladies in neighboring buildings have decorated their homes in a similar way. The reason it is named Residence Hilda instead of Hotel Hilda is because the setup is halfway between a self-catering apartment and a traditional hotel. We rented a full-sized ‘deluxe’ apartment, complete with kitchen and living area. The kitchen included a stovetop and oven, and came with some of the basic essentials. All we had to do was pop to the nearby markets to buy what we needed to cook some delicious meals. The apartment was also perfect for our needs, as it was not just the two of us – my mom was accompanying us as part of a larger trip around Italy. We had plenty of room, with Chris and I staying in the bedroom. Mom slept on the pull out sofa but was so impressed with it that she insisted I mention just how comfortable it was! We loved the independence the apartment gave us, and it was definitely the right choice for us. Aside from practicalities, it helped me live that dream by pretending I was a local. Every morning we would walk into our kitchen and make ourselves coffee and breakfast. While some would prefer to have someone do it for them, we stay in so many hotels that this was refreshing, and made that dream of living in Florence that bit more real. The apartment itself was tastefully decorated and we loved having the small balconies to look out of. Again, white, cream and tan were the dominant colors and the floors were made of a gorgeous teak wood. When we arrived we were greeted by a beautiful spread of cold meats and wine, this was a lovely touch which made us feel instantly welcome. Another nice feature is that they offer vouchers for the café across the street, in case you want somewhere to sit and relax for breakfast. So when we didn’t feel like making it ourselves, this was a great place to get a warm breakfast of pastries and sandwiches. Despite allowing you the privacy of an independent apartment, Residence Hilda does have all the amenities you expect from a hotel, so that you never find yourself having to pick up the slack. Your apartment is cleaned daily, and the reception is open between 7AM and 11PM every day. They also offer services like airport transfer and luggage storage, as well as a garage if you have a car. Best of all is the concierge who will use his local knowledge to help you make the most of your stay in the city. 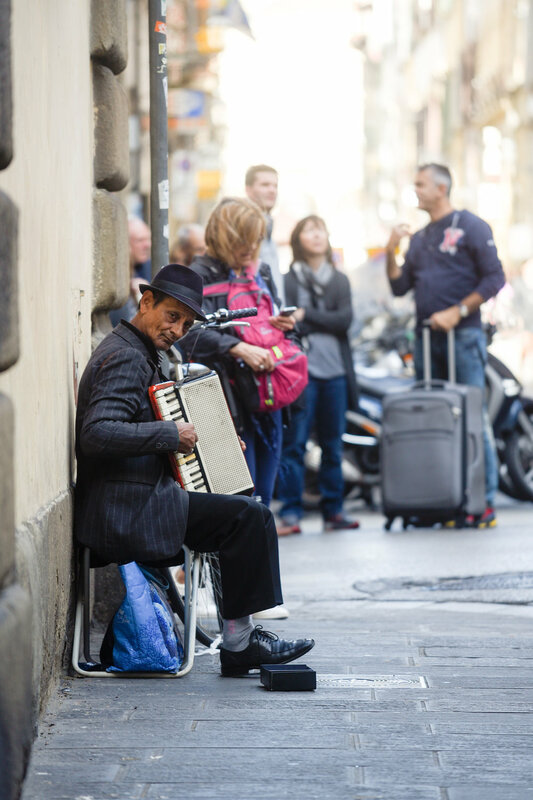 Of course, as this is not a standard hotel, don’t expect the extras like swimming pools and gyms – Florence is not the place to be spending your time using facilities like this anyway, it's true magic lies outside on its streets. Out on those streets, there are just so many things to do, and most of them are right outside the doors of Residence Hilda. The Duomo is probably its most famous landmark, and as it looms over the street, it feels near impossible not to make it your first stop. Inside it is an enormous space and the dome is painted with impressive frescoes. Climbing up to the top is also an option, with the views of the city which are spectacular. 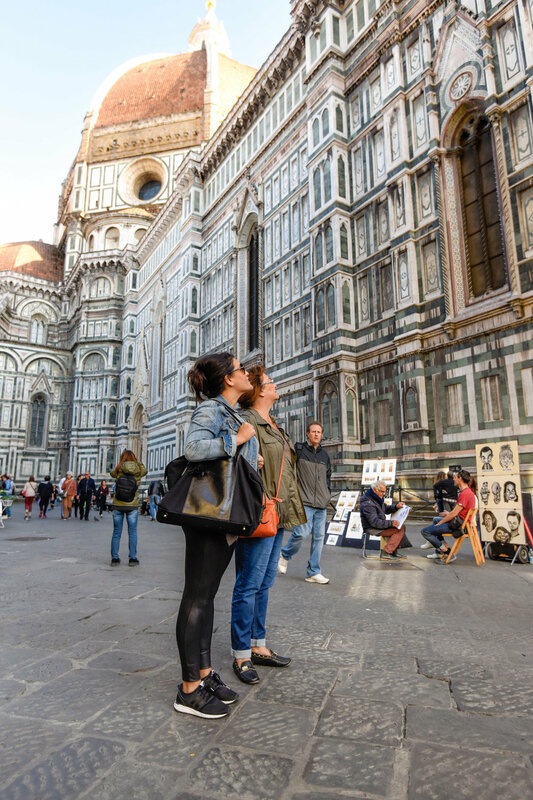 From here most will go to one of the art museums as Florence is home to the two most visited in all of Italy. There is the Accademia Gallery where Michelangelo's famous David statue is housed (alongside several other renaissance paintings and sculptures), as well as the Uffizi which has a vast array of work by some of the world’s most famous artists. The Uffizi was created by the famous Medici family who dominated the city for centuries. Those who are really interested in their history can see their palace, as well as numerous other churches and buildings commissioned by the clan. Another historic marvel is the old bridge or Ponte Vecchio, which is half conventional river crossing and half extension of the city itself. Small medieval shops are built into the structure of the bridge, and these are still in use today. There are just too many sites in the city to mention and those with more time should perhaps just wander the old streets and see what they find...after all that is the best way to explore :) Alternatively, Florence is located in the heart of Tuscany meaning that the region’s distinct landscapes are easily accessible. What’s more, other beautiful towns like Pisa, Siena and Bologna are all no more than an hour or so away. 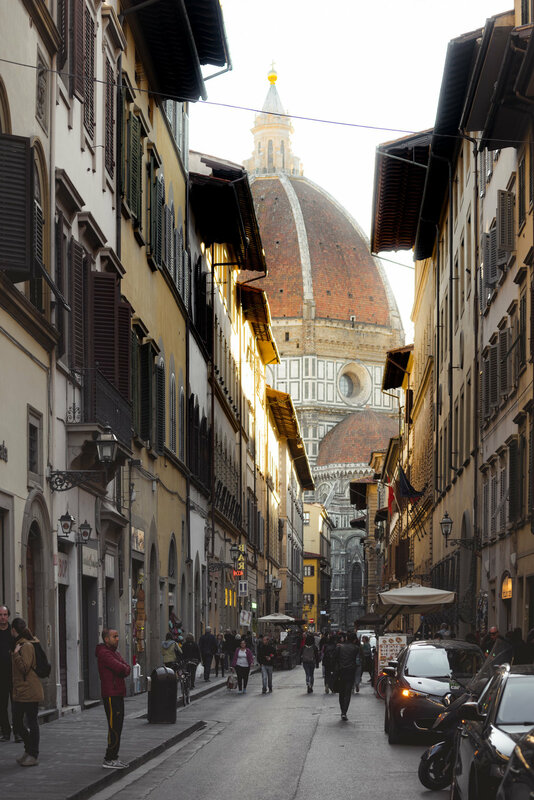 Florence is a magical city, and Residence Hilda was the perfect place to stay while seeing it. It was a warm and friendly place, and we can’t wait to come back! Residence Hilda makes the perfect choice for couples or families who like a bit a privacy, although it would suit just about anyone who wants to live like an Italian for a couple of days.